Earlier this year it was time for netizens from across the globe to tune in and cast their votes in 13 different categories during DramaFever's Second Annual Drama Awards. DramaFever has also graciously posted the whole ceremony. Complete with special guest appearances and the acceptance speeches that were sent in from Korea, for the viewing pleasure of those of us who were unable to make the trip out to NYC and attend the awards in person. Hey, Aunnie here and I've come to reprise my role as Soju-Like-Kdrama's dedicated stalker. 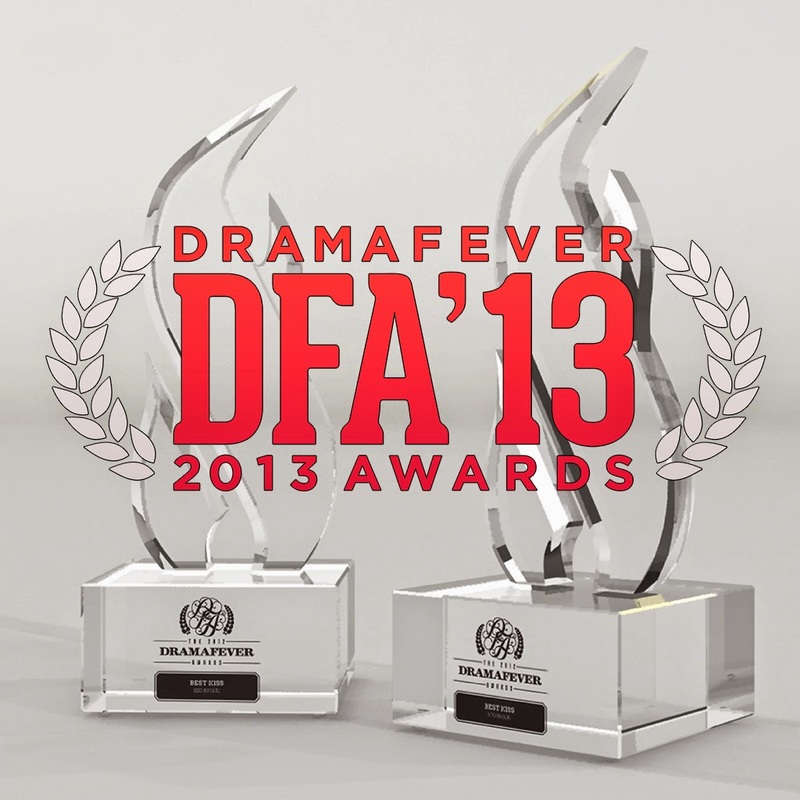 I, too, have much to say about the 2013 DramaFever Second Annual Drama Awards. Look for me in green . . . . Alright, Firnlambe, take it away! This next section is long because I've listed the nominees along with the actual winners, just in case you've forgotten who was up for each category. How do you guys feel about who won this year? Do you agree? or do you believe some one else should have won a specific category? I know for me, my feelings are mixed. On one hand some of the winners are well deserved. For example . . . Best Couple. How adorable are these two together?!?! I personally think Krystal Jung and Kang Min Hyuk should become a real legit couple ASAP . . . need some proof? That should be enough shouldn't it? . . . *stares off in S.Korea's general direction* . . . I'll be waiting for that official press release regarding them dating soon SM Entertainment. . . . . . .
You and I are in complete agreement here. These two need to be a couple in real life--their portrayal of Chan Young and Bo Na is definitely one for the books; they looked and felt sincere in their feelings not only towards each other but everyone character they encountered. Well deserved win. But then on the other hand, what's an award ceremony without some controversial wins . . .
. . . . whaaaaaaaat? who said that? ::Looks around:: I . . . I didn't say anything. Aunnie, did you say something? I heard it too Firnlambe, don't worry . . . the voices in your head aren't back again! Yes, the mysterious voice from the darkness is indeed correct, The Best Actor Category has made me more than a little peeved at DramaFever. Lee Min Ho has now won that category both years that the DramaFever Awards have been hosted, and while I do agree he is an awesome actor--he did NOT deserve best actor this year, not by a long shot. This category was a popularity contest pure and simple. I feel DramaFever did not attempt to pick videos for voter's would be able to judge fairly from. I mean . . . did you even SEE Joo Won's acting in Good Doctor? It was phenomenal! You are 110% correct in this. I'm not above saying I was more than a little peeved. I absolutely adore Lee Min Ho's acting, I do--but his roles have begun to become a little repetitive. Remember when he starred Boys Over Flowers wherein he played almost the exact same character . . . . in 2009? Don't get me wrong, I loved Heirs but Joo Won played a role that was completely original and unique not only to his acting career but to the Kdrama scene entirely. And he was flawless in it. Beats this . . . . .
By far . . . Seriously how did Joo Won not win. If you never knew who this actor was and were watching him act for the first time, I am 99.99% positive you would think he actually had autism. Best Couple Not Meant To Be was another category that the Heirs cast won where I feel they should not. I feel that the only reason why Park Shin Hye & Woo Bin did win, was because the kids and teens only voted for the eye candy and didn't vote based off the the drama's plot and the characters that were behind it. Any of the other couples would have been a better choice. Personally I was hoping for Kang Gary and Song Ji Hyo, I know Running Man is technically not a drama, but the chemistry they share when paired together is so strong it's easy to forget that the Monday Couple is not an actual couple . . . hence I thought they should have won lol buuuuuut if we go off characters that were from an actual drama, I'd have to vote for Gu Family Book. That couple is just such a sad coupling, if you pay attention to the story you can really feel how much they should have been together. Best Couple Not Meant To Be should have gone to Gu Family Book. Plain and simple. The writers even wrote Choi Jin Hyuk's character back into the story after killing him off. Wol Ryung, in the original version, was meant to stay dead but his character and his character's tragic love story, was so well loved by fans that the writers literally wrote his character back into the story just to bring him back. Ahh . . . Hello . . . . that says something. And the fact that I'm saying this even though Woo Bin, who is my 2nd favorite Kdrama actor--He's her favorite actor . . . she just wont admit it *hush up Firnlambe* , won should SAY SOMETHING. Just sayin' . . . . I'm under the impression that the voter's who chose Park Shin Hye as best actress . . . . clearly . . . did not watch "My Love From Another Star". Jeon Ji Hyun was simply . . . . outstanding in that drama. Period. She played her character so well that when she transformed from the ditzy and overly dramatic Drama Queen to the smart and tough as nails actress towards the end--it was smooth enough that it was believable. This actress went all out for her role and I wish I could make my own Kdrama Award and present it to her for all the fans who voted for "My Love From Another Star" and didn't see our actress win. And for all the haters . . . . Park Shin Hye is my favorite Kdrama actress--so can it. I'm with Aunnie on this one, Jeon Ji Hyun was absolutely brilliant in My Love From Another Star. It did take me a few episodes to warm up to her, but her quirky over the top charm quickly won me over. Shin Hye's character on the other hand--was just . . . your typical "oh woe is me!! All the rich boys are vying for my attention" female lead. No real depth to the character at all. Very disappointing. The last category we will be mentioning in this post is Best Drama . . . . and would you look at that--Heirs won . . yet again. So many great dramas this year, it must have been really tough for DramaFever to narrow it down to a mere 6. Personally I was torn between Gu Family Book and The Master's Sun (or TMS as I like to say) Both were exceptionally good . . . both sent waves of feels across my Kdrama heart. Each drama had its pros and cons, but if I HAD to choose, I would pick The Master's Sun. I connected with that show much more strongly than any other show on the list, even Good Doctor--and I LOVED that drama. The chemistry between our leading couple in TMS had our Kdrama feels all tangled up in knots. Between the legitimately creepy ghosts, our wonderfully charming cold hearted business tycoon, the quirky crazy female lead, and a Second Lead who gave us all near fatal doses of Second Lead Syndrome--or SLS. Finding a drama that had all these factors rolled up into one neat package, was probably not an easy thing to do. And you all must know how I feel about who won Drama of the Year . . . . "Good Doctor" was inspiring. Heirs did not inspire me. 'Nuff said. I think we'll stop our thoughts here. So folks . . . which categories did you feel deserved a win? and which one's did you disagree with? Did you feel Heirs deserved each and every win? or were you rooting for a different drama this year? Both Aunnie and myself would LOVE to talk about it with you in the comment section below. lol almost all we do is RT Hallyu news or messages we find from other fans.